Join the discussion on our forums! Come discuss Stormcrack over in our dedicated Stormcrack discussion topic. So good in this meta. Totem Golem, Frothing Berserker, Flamewaker, Twilight Elder, Tomb Pillager, and Azure Drake are everywhere. Takes 'em out nice and clean. So happy to see this card because my Crackle says "Deal 3 Damage Overload : (2)"
Better Crackle in my opinion. 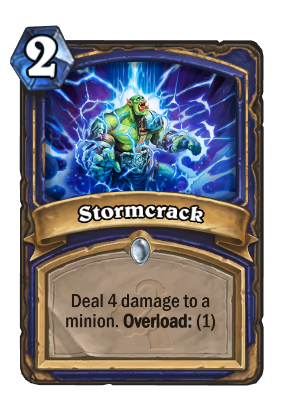 Of course Crackle is better if you want to use the card as burst damage, but Shaman has a lot of ways to do Burst damage so this card is better in my opinion. Using Crackle as a removal is a desperate move. Anyways.. The golden animation is REALLY beatiful. Pretty good, not incredible, or even great when compared to the likes of Rockbiter Weapon, but very solid, two mana works great with Tunnel Trogg, and two mana in general is great when you can occasionally remove 4-drops with this! I'm giving this a "playable" rating. It a good day when this is the worst Shaman card out of the set. Average value Crackle that doesn't go face, it's kinda bad if you think about it. Feel like this could do 5 damage since it doesnt go face but im sure they tested it with 5 damage. Yeah but that makes you discard a card and without the warlock hero power I'd rather just overload for 1. I think it will be good. 2 mana for 3 damage is a good base for all classes. Not many classes can do 4 damage from hand, early game. I'd have to say this is the worst Shaman card in the set. and it's still not that bad. Wow, Shaman has made a comeback!! Well it's an efficient answer to Brann, which will likely be running rampant soon. Ugh, it's such a board control card. I'm drooling everywhere.